Atrazine has been a dirty word among environmentalists for decades. Now state and federal agencies are coming down on the weed killer, amid troubling evidence that it disrupts hormones and contributes to birth defects. This month, California added atrazine to the Prop 65 list of toxic chemicals since it's known to cause reproductive harm. And in June, the U.S. Environmental Protection Agency declared, "there are risk concerns for mammals, birds, reptiles, plants and plant communities across the country for many atrazine uses." The agency opened a public comment period for its atrazine draft ecological risk assessment, which is based on new studies. By the end of the year it will issue a separate report on atrazine's human impact. It's a major about-face for the EPA. 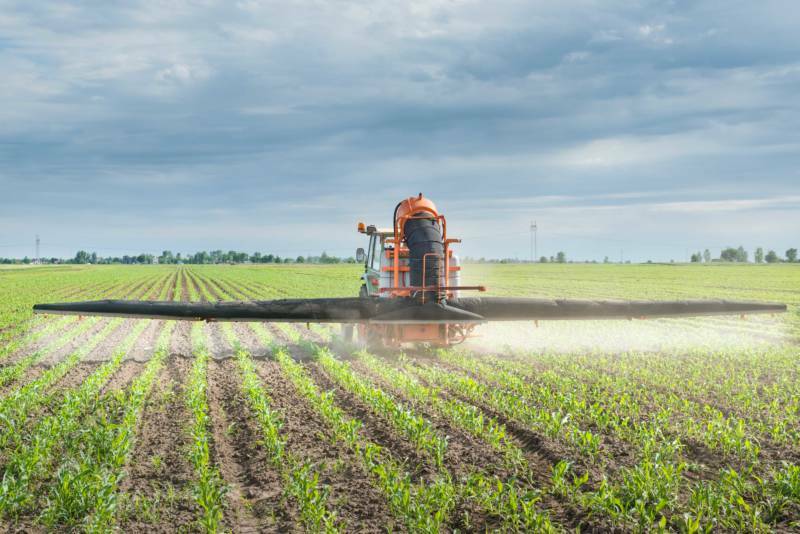 Initially, in 2006, the EPA said atrazine wasn't a concern, and that "the risks associated with the pesticide residues pose a reasonable certainty of no harm." Ten years later, the agency has changed its tune. "What the EPA is saying now, which I told them 20 years ago, is that this compound is found at levels in the environment where it's known to affect animals, wildlife, laboratory animals and the data suggests also affects humans," says biologist Tyrone Hayes. The UC Berkeley scientist has spent decades researching atrazine's health implications on amphibians. He discovered that the pesticide chemically castrates male frogs. After Hayes published his findings about the chemical, Syngenta, the Swiss-based company that produces atrazine, attempted to discredit him. Atrazine is the second most commonly used herbicide in the United States but chances are you've never bought it. It's mainly used on Midwestern corn, sorghum and sugar cane crops. California uses more than 20,000 pounds a year, mostly on corn and grass for livestock in San Joaquin and Imperial county, according to Paul Towers from the Pesticide Action Network. It's also occasionally sprayed on golf courses and lawns. In home improvement stores like Lowe's and Home Depot it's sold as a fertilizer and herbicide for grass, although in California only certified applicators, like farm owners, can purchase it. Under Prop 65, the state must publish a list of chemicals known to cause cancer, birth defects or other reproductive harm. California businesses must also warn the public of exposure to substances on the list, which is why you may have seen signs at gas stations, parking garages and convenience stores. Starting July 15, 2017, products with atrazine sold in California will require a warning if exposure occurs at high enough levels. The state is currently deciding what that level should be. Since approval is required to purchase atrazine, the new labeling requirements will mainly affect the farming industry. Consumers likely won't see a change on the products they buy. Towers says there's little concern about the agricultural chemical contaminating California produce, but tap water is a concern. "It has the ability to persist in water for long periods of time, particularly through drinking water, that's one of the greatest threats to our health and that of our children," says Towers. The chemical seeps into soil and enters waterways, where it can contaminate tap water. The EPA requires workers using the pesticide to wear protective gear and doesn't allow spraying near rivers, lakes or other waterways. A 2004 Environmental Working Group report found dangerously high levels of atrazine in drinking water in Riverside, Bakerfield and San Bernardino. The EPA recently established a new "level of concern" for wildlife exposed to atrazine. Anything above that level likely causes harm. Unfortunately, the agency's own reporting shows this environmental level was "exceeded by as much as 22, 198 and 62 times for birds, mammals and fish, respectively." Syngenta criticized the EPA's draft risk assessment, saying it "contains numerous data and methodological errors and needs to be corrected." In an email, a company spokesperson said, "atrazine’s safety has been established in nearly 7,000 scientific studies over more than 50 years." Hayes says it's good news that the state added the pesticide to the Prop 65 list, but the federal review feels like too little too late. "It's like those stories you hear about the guy that's been in jail for four years, who was falsely accused of murder," says Hayes. "Of course you're happy, now you're out of jail, but you've also been in jail for four years — or in my case twenty years — so it's sort of mixed feelings." Reached for comment, EPA spokesperson Cathy Milbourn said, "EPA considers all available science, including studies submitted to the agency in support of registration, as well as scientific open literature, in developing its risk assessments and decisions to register pesticides." The European Union banned atrazine in 2004, citing ubiquitous water contamination. But the EPA won't say whether a ban is on the table, despite the mounting evidence. Why? Hayes opines that economic interests play a role — atrazine is big business for Syngenta. Even the Prop 65 designation took over a year because Syngenta sued the EPA and the state of California to delay the decision.